This model is available with and without mounting studs. Regular model without studs is shipped by default. Please leave a note during checkout if mounting studs are preferred. 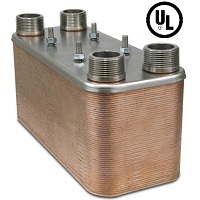 Applications: BT Series heat exchangers designed especially for hydronic heating and cooling applications, including radiant heating, ice and snow melt applications, domestic hot water heating (DHW), outdoor wood stove / boiler / furnace heating, hydraulic oil cooling, and as a general alternative to shell & tube heat exchangers.